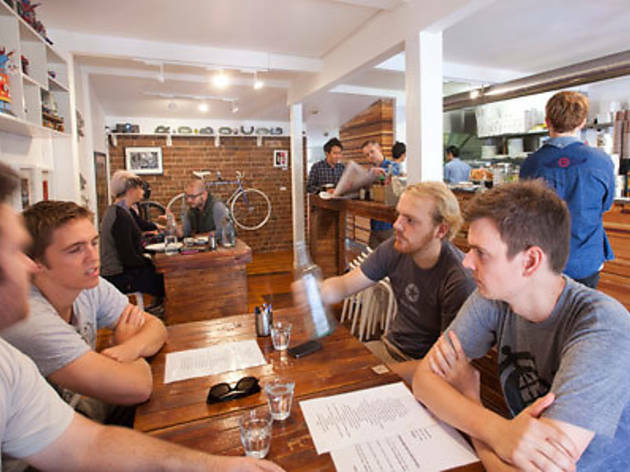 Robo Cog proudly boasts the hipster trifecta: good coffee surrounded by fixed-gear bicycles and vintage robot toys. Opened five months ago by three Thai dudes – House, Jet and Winny (yes, one name each, like Madonna) – in a sweet-looking cottage complete with white picket fence. Although it only seats 20, Robo Cog is surprisingly spacious. You may have to wait for a table at peak times, but once you've secured a spot stretch out and enjoy some people-watching. Kick things off with one of the 15 different fresh juice combinations - we recommend the pineapple pick me up - while you peruse the sizeable menu. If you need a bit of a jump start order the freezochino, easily one of the best iced coffee frappes we've had to date. The breakfast trifle is a mix-up of yoghurt, honey, mixed berries and toasted granola, topped with slivers of Granny Smith apple – an excellent argument for eating dessert for breaky. If your tastes run to savoury then the chicken quesadillas are a winner – order them with a side of the house-made Mexican salsa. Traditionalists are also catered for here, the eggs Benny (Benedict) is a credit to the classics. Robo Cog is very easy on the eye, but it's the great food and jovial service that will ensure we return, and regularly at that.